I am currently studying in Melbourne, Australia. Apart from doing some trips around this country, I had the opportunity to visit Thailand a couple weeks ago. It was definitely a culture shock! The tour started in Bangkok, which is such a busy, crazy, and amazing city. We spent three days there where we got to experience street markets, delicious Thai food, tuk tuk rides (their version of a taxi but more fun), a cooking class, multiple temples, and the exciting nightlife. On our night out, I even ate a grasshopper… it was disgusting! One of the best parts was seeing the giant reclining Buddha at Wat Pho. We went from one extreme to the other—upbeat city to a serene national park. We said goodbye to Bangkok and boarded an overnight train to Khao Sok National Park. Our own private boats were waiting for us to transport us through the turquoise lake to the floating bungalows we would be sleeping in that night. It was just a relaxed day of swimming, kayaking and hanging out. It was amazing to be sleeping in the middle of the park, on water, surrounded by mountains. Unfortunately, we only got to spend one day there so we were on the move again. We took a boat from the bungalows, a van to the ferry, a ferry to the island of Koh Phangan, then another van to our resort. The resort was such a beautiful, “Instagrammable” spot. It was a group of white bungalows right on the beach. My favorite part of this place was either relaxing in the infinity pool that looked onto the ocean or laying in the hammocks on the bungalows enjoying the view. The second night there, 90 of us painted our faces and bodies with glow in the dark paint for a beach party. Our whole group took over the beach and spent time dancing and watching fire performers. The tour guides made sure to continue showing us some Thai culture. One of the days we got a Thai massage on the beach, and the next we went to a Muay Thai (Thai boxing) class. 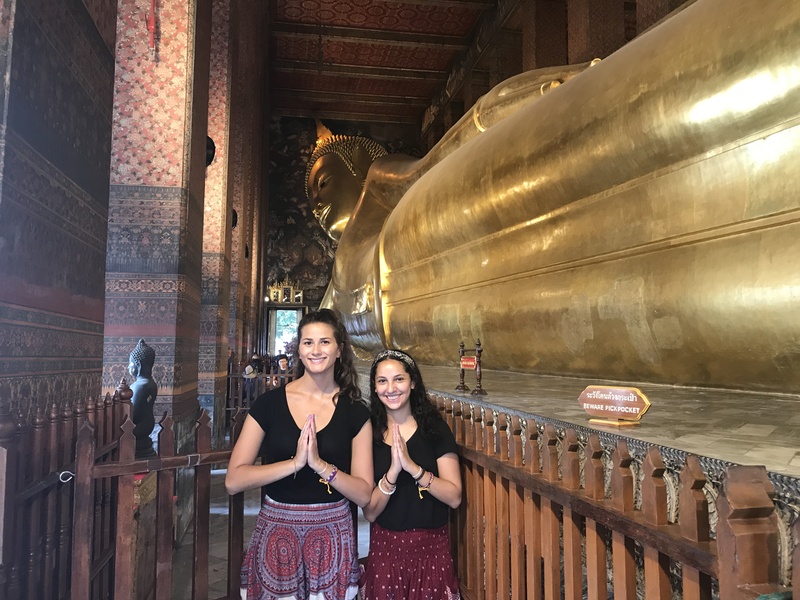 The trip was the perfect mix of learning about the unique culture of Thailand and relaxing. On top of gaining some awesome memories, I also gained some great friends! This was my first time visiting anywhere in Asia, and now I can’t wait to back to see what other countries have to offer. It was certainly an experience of a lifetime that I would recommend to anyone.